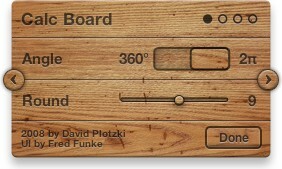 To get to Calc Board’s settings, place your mouse onto the widget. 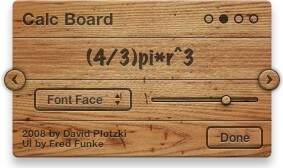 A board will appear, featuring four objects. 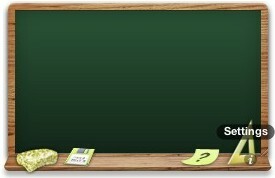 Clicking the sponge will wipe any text off the board. Your variables and functions will be kept untouched. Clicking the triangle in the lower right corner will flip the widget, taking you to its settings. On the first settings page, you will find a switch for setting the angle mode and a slider for choosing the rounding precision you need. Click on the angle switch to choose between Degrees and Radians. Click on the slider or grab the sliding knob to choose the rounding precision you want. This effects only the final result. Any internal calculation will be done using the highest precision available. At the end of a calculation, the result will be rounded and shown to you. The next options panel (click the right arrow or the second circle in the upper right corner to get there) lets you choose a font face and adjust the text size. Click the button in order to open a list of fonts. Choose the one you like most. The slider to its right adjusts the text size. Click the switch to choose whether you want to allow Calc Board to check for a new version when Dashboard opens for the first time (e.g. after a reboot). 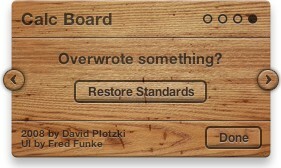 If dashboard is already loaded, the widget won’t check again until you log out or reboot. To manually check for updates, press the button next to the switch. 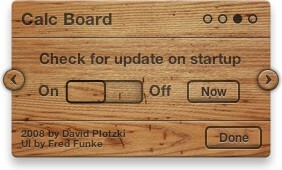 The widget tells you when an update is available by showing a yellow badge on its front side. The widget saves user-defined variables and functions as well as changes you do to any predefined constant. If you need to restore the widget’s constants to their default values, press the button on the last settings panel. Variables and functions that did not come by default will not be touched and keep their values. Everything you find on this help site will be reset to its standard values and definitions.